The Bluff Wilderness Hiking Trail is located within the Five Bridge Lakes Wilderness Area which is located in Mi’kma’ki, the unceded and unsurrendered ancestral land of the Mi’kmaq (L’nu). This area was designated under the Wilderness Areas Protection Act in October 2011. The Bluff Trail is south of Highway 103 where it crosses the Chebucto Peninsula just west of K’jipuktuk (Halifax), Nova Scotia. It begins inside the Woodens River watershed and climbs onto the high ground (“The Bluff” ) between the Woodens River watershed and the Nine Mile River watershed to the east. The trailhead is located on the Beechville-Lakeside-Timberlea (BLT) trail at a point midway between the Hwy 103 overpass just south of Exit 4 and the northern tip of Cranberry Lake. A parking lot has been constructed specifically for visitors to The Bluff Trail. See Getting There. The trail was constructed by the Woodens River Watershed Environmental Organization (WRWEO) under a letter of authority from the Nova Scotia Department of Natural Resources. Loops 1 & 2 (the Pot Lake Loop and the Mi’kmaw Hill Loop formerly Indian Hill Loop) were constructed in 2003 by six students employed for two months plus help from some twenty volunteers, all coordinated by Peter Romkey. Loops 3 & 4 (called the Bluff Loop and the Hay Marsh Loop) were constructed in 2004. The trail is in the form of four stacked loops that eventually go around Upper Five Bridge Lake. The loops are colour-coded. Together, the first two loops are about 12 km and take a full seven hours to hike. The four loop system covers over 30 km. There are canoe-access points at the south ends of each of Cranberry Lake, Frederick Lake, and Hubley Big Lake (see map, above). The signs at the trailhead emphasize that this trail is for experienced hikers; they warn hikers of some of the potential dangers of wilderness hiking. WRWEO members David Patriquin and Jim Carwardine talk to Cyril Lunney of CTV’s Breakfast Television (Halifax, Nova Scotia) about what to bring when you go on The Bluff Wilderness Hiking Trail. Carrying a mobile phone is advised and always let someone know your plans and expected time of return. You should not rely on your phone for navigation though. Plan your excursion to leave plenty of time to return during daylight hours and cut it short if it’s taking longer than expected. Hikers should be alert since they will be travelling through bear and moose country. There are also coyotes. The trail is a wilderness trail, designed to challenge and delight the experienced hiker. Hikers should use caution at all times. Deer hunting season runs from the last Friday in October to the first Saturday in December inclusively. Hunting is now permitted on some Sundays (in 2017 it was the first two Sundays of the season). Hunter orange is recommended in this period. Please use The Bluff Trail with added caution during this period. The trail runs through ecologically sensitive barrens. The trail is generally quite narrow and designed only for walking. We intend that no ATVs or bikes use the trail. It is critical that hikers stay on the trail, given the sensitivity of the area. The trail has been carefully routed to avoid wet areas and especially vulnerable places. Hikers are expected to pack out what they carry in and practice leave-no-trace techniques of wilderness travel. 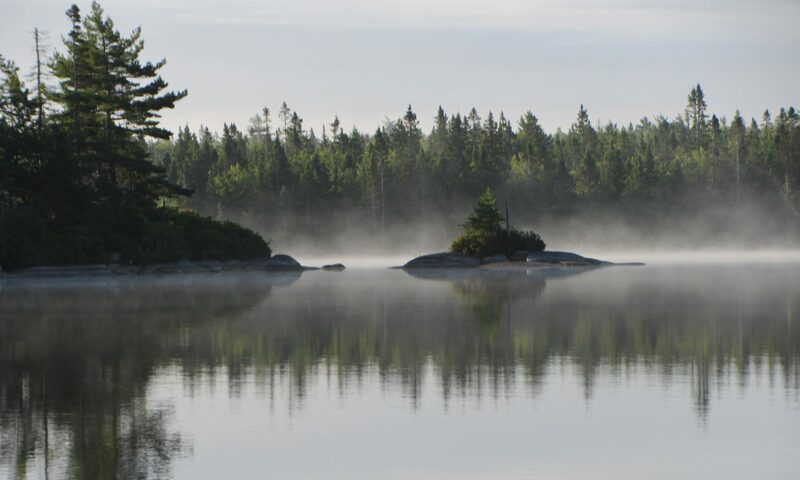 The trail passes through several landscape types, including patches of deciduous woodland dominated by red maple or oak as well as large black spruce stands, mixed red spruce/deciduous forest, fens, and open granite barrens. The barrens support extensive populations of broom crowberry, a coastal plain species threatened elsewhere, and the rare mountain sandwort. Over 100 species of lichens have been documented on the trail. The trail moves generally along high ground, affording frequent stunningly beautiful vistas of the surrounding wilderness and lakes. At one point it runs through a stand of large old growth red spruce between Pot and Cranberry Lakes. The third loop takes hikers over the Bluff plateau, which is one of the highest points near Halifax; a large stand of jack pine occurs on the branch common to loops 3 and 4. Three levels of government supported the design and construction of the Bluff Trail. WRWEO gratefully acknowledges funding from Halifax Regional Municipality and Nova Scotia Office of Health Promotion, Sport and Recreation Division, with matched funding from the Atlantic Canada Opportunities Agency. With their generous financial support and authorization from Nova Scotia Department of Natural Resources, combined with countless hours of volunteer work, the Bluff Trail became a reality. The purpose of the trail is to allow the Woodens River community and the public generally to become aware of the extraordinary natural assets of this area, on the principle that awareness is the first step in protection. Much of this land is barrens and unsuitable for harvesting wood and, at least until recently, difficult to develop into residential areas. As a result it has been left wild. It is wild not only in the sense of being undeveloped but in the sense of not being directly controlled by human needs and interests. Hunters visit the areas in hunting season, but for the most part these areas have remained undisturbed by frequent human travel. The bush in these areas is often extremely dense. Hiking in these areas is difficult without trails. When people go there, they are immediately impressed with its wildness. The experience is forbidding and alienating for some. For others it creates feelings of awe and even reverence and puts them in touch with parts of their natures that go untouched in the normal course of civilized affairs. For them, walking in the solitude of ancient rocks and fens will bring wonder and joy. They may hesitate to let others know about it, afraid it will be destroyed and that they will have betrayed the wild lives that own this place. They may be afraid too that if they don’t, the consequences will be the same. We believe that once people have experienced this wildness, most will understand its importance to their lives and the lives of their children and will not let it be destroyed. On behalf of all the wild things that make this land their home and with reverence for the First People who preserved this land before us, we dedicate The Bluff Wilderness Hiking Trail to wilderness preservation. We do this in trust that we can learn its deep beauty, in trust that we can understand and delight in the wildness in ourselves that we share with the rocks, earth, water, and teeming life and spirits that surround us, and in trust that we will work together to protect this sacred heritage. That statement was written by Richmond Campbell on completion of the trail in 2005. While the dedication of the Bluff Wilderness Hiking Trail, written in 2005, acknowledged that the land had been preserved by the “First People”, none of the names used for the trail are Mi’kmaw names. In fact, the trail consists of four stacked loops which were all named more than a decade ago based on settler names used to describe the geography of the area. The names include: Pot Lake Loop, Indian Hill Loop, The Bluff Loop, and Hay Marsh Loop. The board of directors find the name of the second loop (Indian Hill) to be inappropriate given that the term “Indian” has long been considered a derogatory and offensive term. Because of this, WRWEO wishes to rename the second loop; however, we think it would be more appropriate to defer to members of the Mi’kmaw community for the selection of another name rather than continuing the pattern of settlers imposing names upon Mi’kmaw territory. We hope that you may be able to introduce WRWEO to one or more members of the Mi’kmaw community who might be willing to advise WRWEO on how we might ask for the community’s guidance on the question of renaming the loop. Following receipt of this request, Mike Lancaster contacted two individuals of Mi’kmaq descent, Ellen Hunt, former chair of the Mi’kmaq Burial Ground Research and Restoration Association and regular collaborator with the Micou’s Island Stewardship program, and Roger Lewis, Curator of Ethnology at the Nova Scotia Museum of Natural History. Roger Lewis in turn communicated with Mi’kmaq of Sipekne’katik (Shubenacadie) District, noting that the territory of K’jipuktuk (Halifax) is within the traditional territory of the Sipekne’katik District. He also communicated with Dr. Bernie Francis, Mi’kmaq Linguist and co-author of The Language of This Land, Mi’kma’ki. The consensus was that the name should simply be changed from “Indian Hill” to “Mi’kmaw Hill”. WRWEO has now renamed the second loop of The Bluff Wilderness Hiking Trail the Mi’kmaw Hill Loop and will work to make the appropriate changes to all future maps and printed materials; however, this process will take some time. More immediately, WRWEO will undertake to update all electronic maps and will refer to the second loop as Mi’kmaw Hill in all social media posts and communications. WRWEO would like to thank everyone who took time to consider this question and assist us in this matter. Particular thanks to Mike Lancaster, Ellen Hunt, Roger Lewis, Dr. Bernie Francis, and Mi’kmaq of Sipekne’katik District who gave their time and thought to this process.